Le lac de Côme ou lago di Como (parfois appelé Lario, par référence au Larius lacus des Romains) est un des plus importants lacs italiens, et est situé dans le nord de l'Italie, en Lombardie, à environ 45 km au nord de Milan. Il se trouve dans les préalpes. Le tour du lac fait environ 140 km, sa superficie atteint 146 km2 et sa profondeur maximale 410 m.
Côme pour la branche sud-ouest (Lac de Côme); Lecco pour la branche sud-est (Lac de Lecco); Colico pour la branche nord (Lac de Colico). Situé au débouché de la Valteline il est traversé par l'Adda, affluent du Pô. C'est un passage obligé pour franchir le col du Splügen, le col de la Maloya, le col de la Bernina ou le passage du Septimer. Transports sur le lac . La circulation régulière est assurée par la Compagnie publique de Navigation qui transporte les passagers dans les nombreuses villes côtières. Les plus anciens ont été mis à l'eau en 1904 et les plus récents dans les années 2000. Les plus lents circulent à 24 km/h et les plus rapides à 64 km/h ( 2 Hydroglisseurs ) Au centre du lac, des Ferrys assurent des rotations fréquentes entre Varenna, Menaggio et Bellagio. 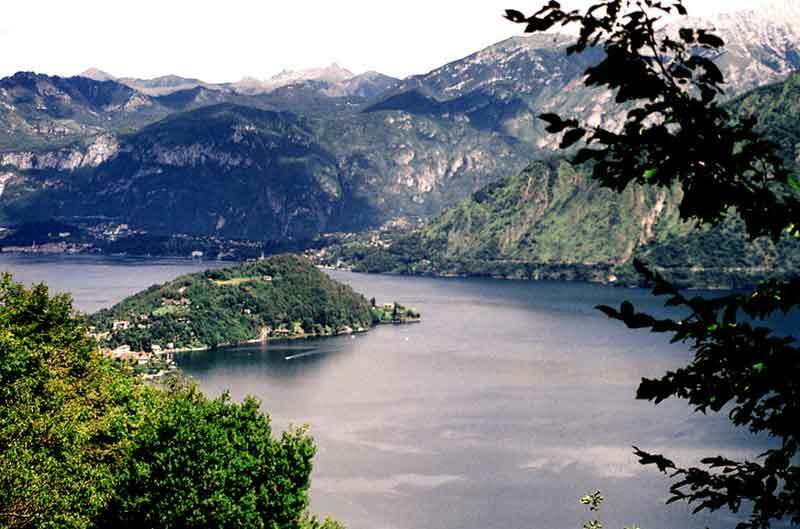 Lake Como is a popular tourist destination. It is a venue for sailing, windsurfing and kitesurfing. In 1818 Percy Bysshe Shelley wrote to Thomas Love Peacock: “This lake exceeds anything I ever beheld in beauty, with the exception of the arbutus islands of Killarney. It is long and narrow, and has the appearance of a mighty river winding among the mountains and the forests”. (since water releases heat energy more slowly than air). Average daily maxima range from about 13 °C (55 °F) in December to 30 °C (85 °F) in July. Water temperatures can reach an average of 24°C (75°F) during the month of July. Snowfall is erratic and primarily affects the higher elevations. Rainfall is heaviest in May and lowest during the winter months. ‘Motorship’ services up and down the western branch and northern end of the Lake (between Colico or Piona and Como town), with additional shuttles to the mid-lake area. ‘Fast services’ that follow broadly the same route but use quicker hydrofoils, stop less frequently and cost extra. ‘Ferries’ that run only between the hugely popular mid-lake villages of Menaggio, Bellagio and Varenna, plus Cadenabbia. Some of these boats carry vehicles as well as passengers. 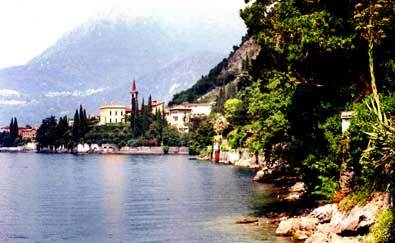 Lake Como is in the northern Italian Lakes District. Lake Como lies between Milan and the border of Switzerland. It's southern tip is about 40km north of Milan. 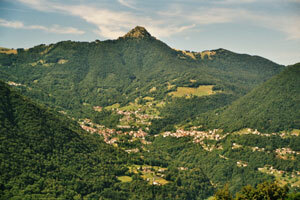 It is surrounded by mountains and hills. 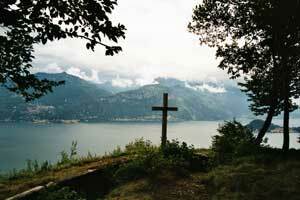 Transportation to and from Lake Como: Lake Como lies on the Milan to Switzerland train line. 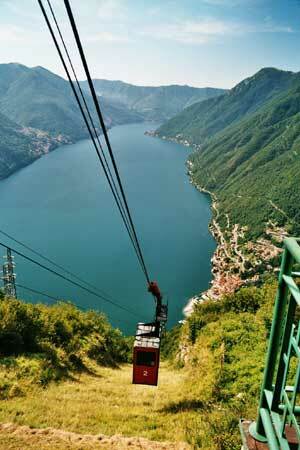 The train stops in the town of Como, the main town on the lake, where there is a tourist office in Piazza Cavour. The Ferrovia Nord Milano, a small train line that leaves Como from via Manzoni, runs only between Como and Milan. 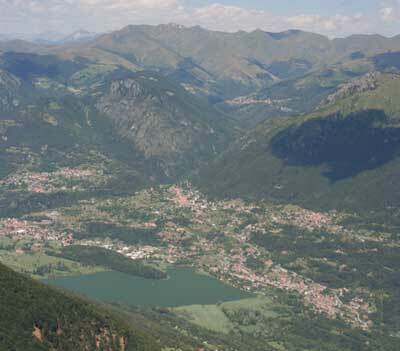 Milan's Malpensa Airport is 40 miles away and has bus service to the town of Como. 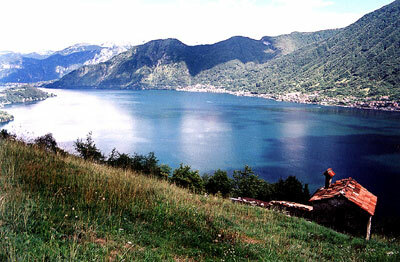 Lake Como is a popular weekend destination for people from Milan so the weekdays may be less crowded. July and August are the most crowded months. Spring and Fall are the best times to visit as it is less crowded and the weather is usually pleasant. During the winter, some services may be closed, but you can ski in the mountains nearby. 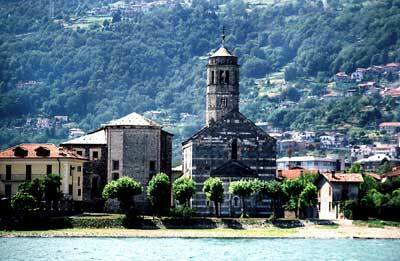 The town of Como has many silk factories so if you want to buy silk Como is a good place to go. Prices are low on designer fashion fabrics. 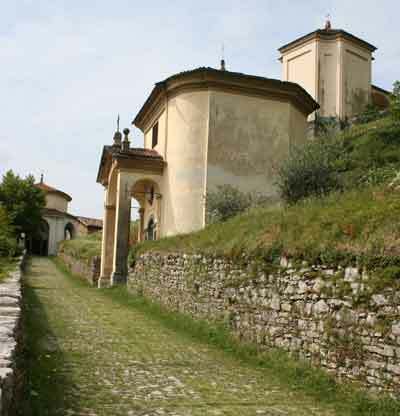 Como also has a Silk Museum dating from 1900 where you can see the entire silk-making process. The Sagra di San Giovanni is celebrated the last weekend of June in the town of Como with folk arts and fireworks and in Ossuccio with a festival, boat procession, and boat race. The Palio del Baradello, a historical re-enactment, is the first week of September. Also in September is a traditional rowing race, Palio Remiero del Lario. There are music festivals around the lake in spring and fall, gastronomic festivals in fall, and drama from January - April. 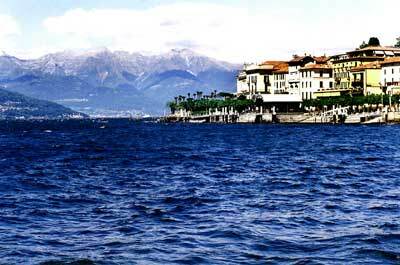 Bellagio, known as the pearl of the lake, is in a beautiful setting and has many nice villas. It is easy to get to by ferry from other cities on the lake. 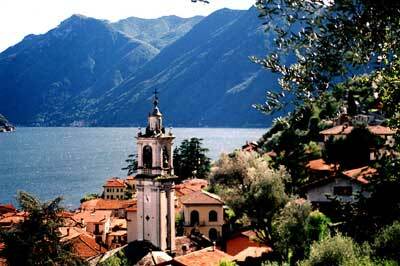 The walled town of Como has a good historic center and lively squares with nice cafes. There are several walking paths near town. Como makes a good base if you're traveling by train. From Como you can take the funicular to the village of Brunate, 720m above Como, for hiking trails and beautiful views of the lake and the Alps. Villa d'Este, in the village of Cernobbio on the west coast, is the most famous of Lake Como's villas. The villa is now a luxury hotel on a wooded peninsula. Each of its 161 rooms is unique. 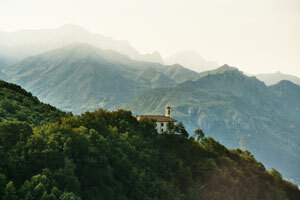 Menaggio, against the mountains, is a lively resort with a lakeside promenade. 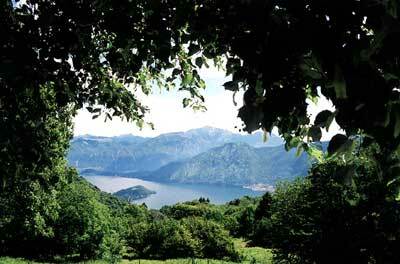 Menaggio is popular with outdoor enthusiasts for walking or hiking, swimming, windsurfing, and rock climbing. Villa Carlotta, south of Menaggio, has beautiful gardens. You can tour the inside with its original 18th century furniture and art works. 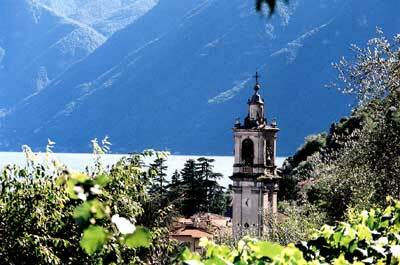 Villa del Balbianello, in the village of Lenno, is also worth a visit and has some unusual treasures. The villa was used as a set for one of the Star Wars movies. The fishing village of Varenna has picturesque narrow alleyways and streets below a castle and a lakeside walking path. Biking, mountain biking, hiking, boating, paragliding and windsurfing. In the winter, you can ski in the nearby mountains. Cruises - there are some interesting cruises around the lake on commercial boats, mainly on weekends in the summer season. Camping - there are a number of campsites around the lake.